James Y. Suen, M.D. is Professor and Chairman of the Department of Otolaryngology- Head and Neck Surgery at the University of Arkansas for Medical Sciences (UAMS). 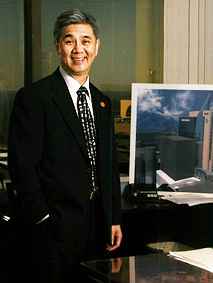 Dr. Suen received his medical degree from the University of Arkansas College of Medicine in 1966. He completed residencies in general surgery and otolaryngology at San Francisco General Hospital and UAMS. A captain in the United States Air Force, he completed a fellowship in Otolaryngic Pathology at the Armed Forces’ Institute of Pathology in Washington, D.C., and was an advanced senior fellow in head and neck surgery at M.D. Anderson Cancer Institute in Houston. He is certified by the American Board of Otolaryngology. Dr. Suen is a fellow in the American College of Surgeons. He is also a member of the Society of University Otolaryngologists and the American Head and Neck Society of which he is a past president. On many occasions he has been awarded the Red Sash Award for Teaching. In 1990, he was the recipient of the Distinguished Faculty Award given by the UAMS College of Medicine. In 1991, he was honored with the Distinguished Citizen Award awarded by KARK-TV and the Governor’s Office of Volunteerism. In 1995, he was selected for the Distinguished Alumnus Award by M.D. Anderson Cancer Center. He served as one of President William Clinton’s personal physicians during his administration. He was one of the co-founders of the Arkansas Cancer Research Center and was the Executive Directors from 2002 to 2007. In 2006, he was selected by the UAMS College of Medicine to deliver the Annual Distinguished Faculty Lectureship. In 2008, he was awarded the Distinguished Professor Designation in the College of Medicine at UAMS.